seven piece winnipeg swing band. swing, blues, jump, jive, rhythm and blues. news, band information, a list of past and upcoming shows, member biographies, reviews, contact information, merchandise and discography. orlando based swing band. photos, show schedule, contact information. a 1940s style big band with an emphasis on danceable swing and standards. features song list, schedule and links. cleveland swing band playing authentic jump blues, danceable swing, and standards. wedding and party band. band information, member biographies, calendar of shows, their cd, contact and booking information. san francisco bay area swing band. contact information, band and member profiles, calendar, cds, audio clips, client comments, song list. jazz band from newport rhode island playing jazz, swing, blues, pop, rock, funk, big band, and dixieland. available for public and private events. band profile, news, contact information, swing links, member biographies. san francisco band playing tunes from the swing era. band biographies, music samples, merchandise, a calendar of upcoming shows, and a list of swing links are provided. los angeles swing band. contains news, a calendar of upcoming shows, audio samples, a discography, a list of links, and information on joining their mailing list and booking the band. st. louis band. biographies, schedule, news, contact information. swing band, includes audio samples, forum, booking form, and faq. Wichita, Kansas based seven piece neo-swing band. You can see our songlist, photos, our calendar, and listen to a couple of songs. Vintage western cowboy swing band. Site includes show dates and audio samples. high-powered swing, jazz, rhythm and blues band presenting song list, event calendar, and biography. virginia swing band. schedule, biography, recordings, audio clips, song list, booking information, photos, links. high-powered swing, jazz, rhythm and blues band out of cleveland, ohio, presenting song list, event calendar, cds, and biography. eight piece band playing swing, jump blues, boogie woogie, rhythm and blues. play list, cd clips and information, band history, appearance schedule, information about swing dance lessons, booking and contact information. san francisco based swing band. news, cds, biographies, calendar or events, large collection of swing and jazz links, scrapbook, contact information. based in the washington, d.c. area and playing elegant swing, big band, and jazz. british swing band. presented by the church of scientology. tour information, lyrics, member information, swing speak, cd, real audio samples. If the business hours of daddyblue swing band in may vary on holidays like Valentine’s Day, Washington’s Birthday, St. Patrick’s Day, Easter, Easter eve and Mother’s day. We display standard opening hours and price ranges in our profile site. We recommend to check out daddyblue.com for further information. 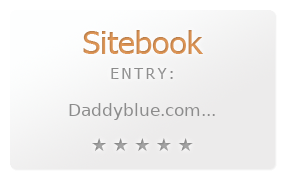 You can also search for Alternatives for daddyblue.com on our Review Site Sitebook.org All trademarks are the property of their respective owners. If we should delete this entry, please send us a short E-Mail.